In case it hasn’t been made entirely clear already, we here at BrainLazy love the indie community. Our primary focus is on games, but indie movies and music are great, too. The only problem is that being an independent maker is tricky. Not only do you have the obvious monetary and marketing hurdles to overcome, but you have to live in constant fear of losing your following by becoming too successful; the dreaded “Selling Out.” So you must keep your interactions and products carefully moderated and limited. But I want more! And I want to see what you can do with serious resources. So I propose a solution. 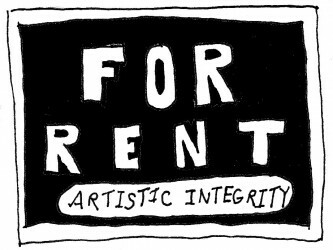 Don’t sell out, rent out. Independent works have a different quality than commercially backed works for a reason. Whereas an indie probably WANTS to make money – you know, so that they can afford food and shelter – a commercial production house NEEDS to make money. Oodles of dollars have been poured into marketing and focus groups and research and distribution. There are health plans and stock prices to think about. Failure isn’t just a setback, it is a catastrophe. A tiny indie group can thus work on something for as long as they want, pouring loving attention into every minute detail and staying pure to a vision or concept. A game can play precisely the way they want it to. A film can evoke just the right emotions. A song can be an experimental exploration of the soul. All of this works out to a work of art that appeals very strongly to a very small audience. Corporations, despite their money, can’t afford that. They need something with broad appeal. So they generalize, smooth off some rough edges and controversial decisions, cater to the mainstream, and otherwise move toward the least common denominator. You end up with something quite likely to be bland, but also quite likely to be profitable. Certain artists would rather die than do that. Hell, certain artists DO die rather than do that. There is this notion that you have to suffer for your art, and that the greatest artists are never recognized in their time. I’m not convinced that having a miserable life of failure and disappointment is a necessity, but some people are so certain about it that they actively avoid gigs that produce a decent paycheck. They are Artists, capital A, and they refuse to compromise. Money is evil, so it must be avoided. They’ll work a bottom rung, thankless day job that they have no respect for so that they can spend their late night hours coaxing to life their next masterpiece. And that’s fine, as long as you are okay with the idea of having very few masterpieces, and never having the resources you would like. Sure, limited resources can force you to be even more creative and produce something truly magical, but there comes a point where no amount of creativity can produce the scale or quality you seek. You’ll need money. I say, so long as you are going to be working a day job you hate anyway, why not let THAT be art, too? It isn’t unheard of for someone to be commercially respected AND successful. Look at Steven Spielberg. The guy made Schindler’s List, a soul-rending, black and white tour de force of a film. He also made The Flintstones and Jurassic Park. Frank Zappa was as big an innovator as music has ever had, and he also wrote a jingle for Remington Electric Razors. And for the absolute apex of the commercial artist, look no further than Norman Rockwell. Here’s a guy who was so respected and influential, he didn’t so much bend to the whims of popular culture as bent popular culture to HIS whims. His skill was undeniable, and he managed to underlay some fairly important social messages by coating them with a syrupy glaze of wholesomeness. Oh, and Santa Claus as we know him is pretty much a collaboration between him and the Coca Cola Company. How’s THAT for a legacy? So rent out your talents and skills in order to earn the cash to do your own thing. I think it is a policy with merit. Do what the big wigs want during the day in order to finance your own projects at night. Make Side A pop music and Side B performance art. I’ll admit that this is a selfish request on my part. I want more of the stuff I like, and I want it to be bigger and better than ever before. But setting that aside for a moment, as much as you value your uncompromising nature, just be careful. Sometimes sticking mono-maniacally close to your ideals and shunning anything approaching mainstream acceptance will shave your fanbase further and further down until you are a bitter ball of poverty and misery, locked away and crafting art that can’t possibly be relevant or meaningful, because you no longer live in the same world as the rest of us. All that manages to do is deprive the rest of us of something we might have liked. And if you really think about it, if you’ve ever had the thought “this would be perfect if I could afford…” and then released the art anyway, isn’t THAT a compromise?